What is the Neuro Storm? The Neuro Storm is an epidemic we see our kids facing today – caused by what I refer to as the “3 T’s”. The “3 T’s” are simply the three categories of stress: Trauma (physical stress), Toxins (chemical stress), and Thoughts (emotional stress). In today’s world, children are being assaulted by more physical, chemical, and emotional stress than we ever did growing up. And this does not come without consequences. Although bumps, scrapes, and falls are certainly a factor, I’ve found undiagnosed birth trauma to be the common thread in nearly all cases I’ve seen in children with these disorders. The attitudes about births at hospitals nowadays is not one that encourages a natural delivery without interventions. Pitocin, epidurals, vacuum, forceps, and C-sections are so common nowadays that they are considered “normal”. The World Health Organization (W.H.O.) says there is no reason the C-section rate in our country should be higher than 5-10%, but hospitals in Wisconsin average a rate of 30%. Chemical stress includes not only the pollution in our air, soil, and water; but also our food choices, household cleaners, and medications – specifically vaccinations. This category could really be an article all by itself. Vaccination is a very polarizing subject, but no matter which side of the fence you fall on, there’s no arguing that injecting live viruses, chemicals, foreign DNA, heavy metals, etc. is one heck of a chemical punch to a young child or baby’s delicate immune and nervous system. Most people don’t associate emotional stress with children, but this is something that begins all the way back at conception and throughout the pregnancy. While in-utero, baby and mother share a nervous system – so if mom is stressed, then baby is stressed. And again taking it back to the culture surrounding birth nowadays, it can be a stressful time! All the doctor visits, the testing, even the classes – they’re all about what can go wrong. If you’ve ever read “What to Expect When You’re Expecting”, it sounds like it was written by Stephen King! The first “D” is Dyskinesia, which simply means something is misaligned and isn’t moving as it should. Think of a door with bent hinges – it won’t swing properly through it’s range of motion. 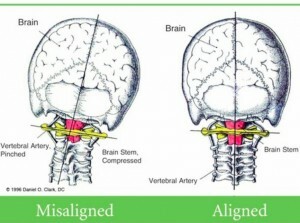 Where this becomes a real problem is in the upper cervical spine because of it’s close proximity to your brainstem and some very important nerves. The undiagnosed birth trauma I referenced earlier plays a major role here. Even a natural birth with no interventions can cause a misalignment to the spine (when was the last time you tried to fit through a 10cm hole!). But in an age where labor interventions are the norm and C-sections are routine, misalignments to the upper cervical spine are more severe with more significant repercussions. In his research, Dr. Guttman, MD, found that spinal injury was present in 80% of the 1,000 infants he examined shortly after birth, causing interference to neurologic and immune function. He concluded that birth injuries to the upper cervical spine are severely under-diagnosed, and therefore under-recognized for their significance. He further stated that the upper cervical spine should be examined after all births, and adjusted by a Chiropractor if necessary. Proprioception: Good, healthy, “brain food” movements. Neurological stimulation from movement “charges” the brain’s “batteries”. Over half of the neurons in the spinal cord are there for this function. 60% of proprioceptive input comes from the spine, a third of it just from the upper cervical spine! So it is a VERY important area (and why the effects from undiagnosed birth trauma so significant). Therefore, if there is a misalignment (or dyskinesia) to the upper cervical spine (likely from birth), the communication is jammed. Proprioception is decreased and nociception is increased. This leads to a “stressed out” Nervous System, otherwise known as Dysautonomia. Gas Pedal Mode: This is survival, or protection mode. Brake Pedal Mode: This is where growth and development happens. Both modes are equally important, but you should spend most of your time in Brake Pedal Mode – but especially when talking about a child who is going through more growth and development than any other time in their life. But if you have Dysautonomia, your systems aren’t in balance. You spend too much time in Gas Pedal (protection) Mode which means you’re not spending enough time in Brake Pedal (growth) Mode. And since “you can’t be in growth and protection at the same time,” this plays a huge role in these kiddos who have a neuro-developmental condition. Dysponesis is the 4th and final “D” and is defined as a reversible physiological state consisting of unnoticed, misdirected neurophysical reactions to: environmental events, bodily sensations, emotions, and thoughts; and the repercussions of these reactions throughout the organism. Basically it’s errors in energy output and organization. Does that sound like something your child struggles with – energy output and mental organization? Stuck on the “gas pedal” at all times (survival mode). ADHD, anxiety, hyperactivity, etc. Brain is disorganized and disconnected. Sensory Processing Disorder, balance/motor issues. Both stuck on the “gas pedal” and disorganized. Autism Spectrum Disorder, epilepsy, etc. 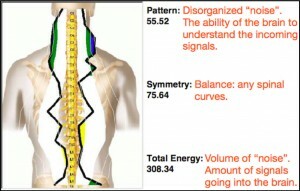 The scan that you see above is used to determine how efficiently the Nervous System is functioning. In this example, the kiddo is a “Drunken Raging Bull”, as evidenced by his low Pattern score and high Total Energy score. These scans are repeated at regular intervals throughout care to track your child’s progress. Most people would not put together Chiropractic and kids, let alone kids with neuro-developmental conditions like Autism. But after reviewing the information in this article, it’s easy to see how the problem is rooted in the Nervous System. The Nervous System runs everything – it’s like the air traffic controller of your body. So as long as your Nervous System and body are communicating properly, everything else can function as it’s supposed to. But if there is a restriction in your spine, this can cause nerve disturbance which interferes with the communication between brain and body. Your spine is more than muscles, ligaments, and bones – it’s a living breathing organ. Think of it as the “middle man” between brain and body. And depending on where the restriction is and how severe it is, it will affect each individual differently. As a Chiropractor, my job is to locate and remove these restrictions. In fact, no other doctors in the world are trained to do this. You go to the dentist, eye doctor, etc. for regular checkups – doesn’t it make sense to get your Nervous System checked knowing it is the most important system in your body? Yes! 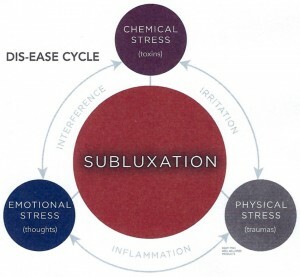 Elite Chiropractic is different than most Chiropractic offices. While we do treat adults with back pain, neck pain, and headaches; our emphasis is kids. The reason is simple: if you remove the nerve disturbance early enough, you prevent a small problem from becoming a big problem. There are only a handful of Chiropractors in the state that have the same level of training as we do, so if you are not local please contact us so we can locate a qualified Chiropractor in your area.